1. If you don’t think the message is very funny – neither will the recipient. 4. It is EXTREMELY rude to forward a mail in such a manner that everyone that receives it can see who you are sending it to and who sent it to you. — When you put multiple recipients on the BCC line (you don’t have to use the TO or CC line at all) then none of the recipients can see whom you are sending the mail to. 5. Delete any irrelevant information and / or attachments before sending the mail. — Don’t send mails with a blank subject line or only the words “Hi” or “Hello” in the subject line – most mail servers block mails like this. 6. 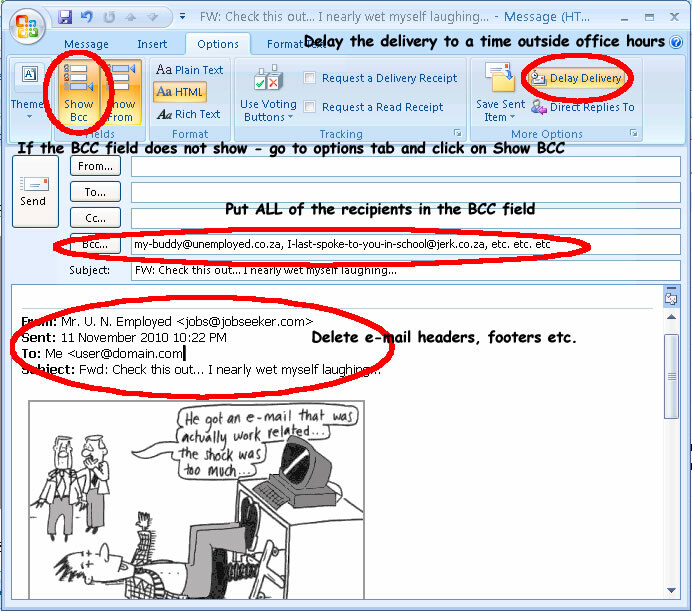 Make sure you are not accidentally forwarding the mail to a client or other inappropriate recipient. 7. If the message is not business related, flag the importance of the message as low as most mail servers will give a lower priority to messages flagged with a “low” priority. 8. Only send “junk” mails outside normal business hours so that you don’t interfere with normal business processes. — If the outbound mail queue on a mail server is very long then it slows the system and the network down and it can cause delays for all inbound / outbound traffic (such as legitimate business mails). 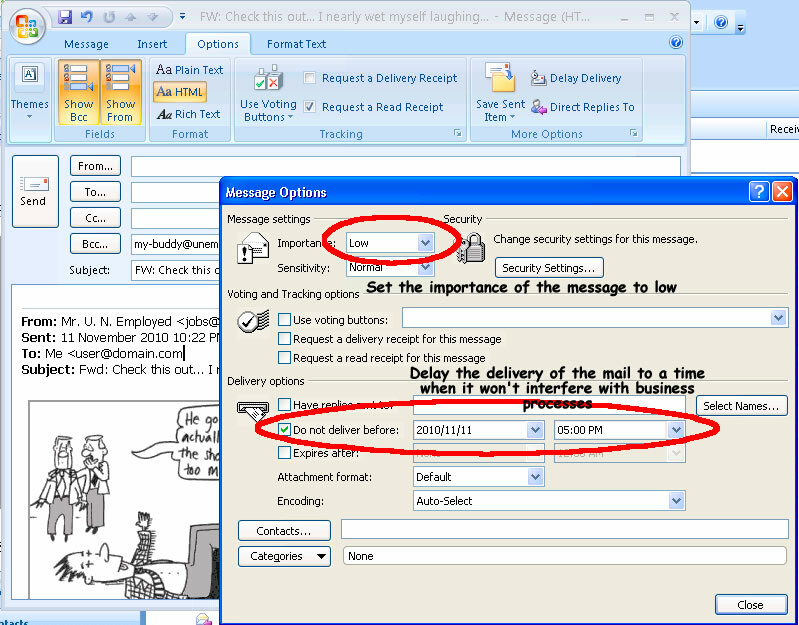 — Users on an Exchange server have the ability to schedule (or delay) an outbound e-mail. Delayed mails (on Exchange connected mailboxes) will still be delivered even if your e-mail client (Outlook) is closed and / or your computer is switched off. haha got to show this to my wife.